Life Is Good No Matter What left a $250 Walmart gift card at the hotel for the couple. Aaron spontaneously took Sandy to Walmart, where they bought each other wedding rings and made vows to each other. “We’ve been together 22 years and never got married, Aaron said. “We decided we had the honeymoon, so why not do this? It was something special for the two of us,” Sandy added. Gina Fox’s life changed in January of 2018 when she was diagnosed with small cell lung cancer. 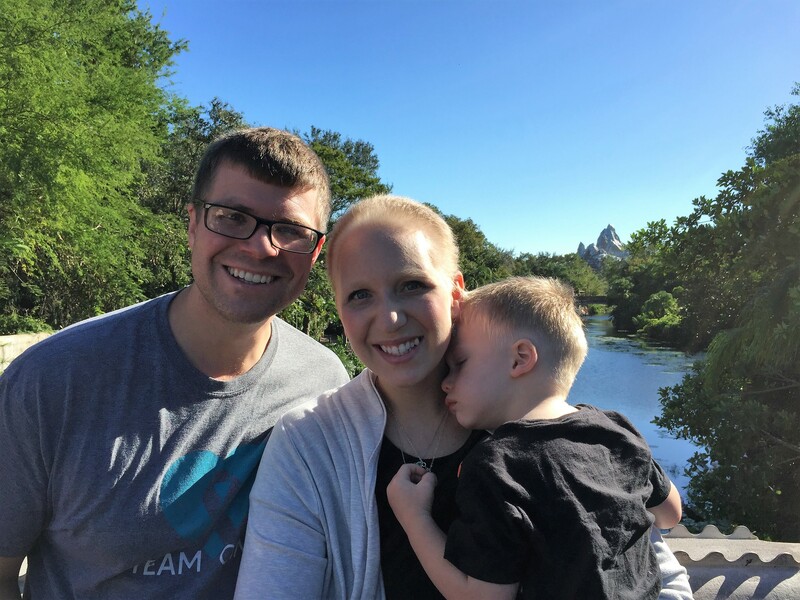 Her whole world came crashing down and was now centered around treatments, appointments and wondering how she would financially cover everything. 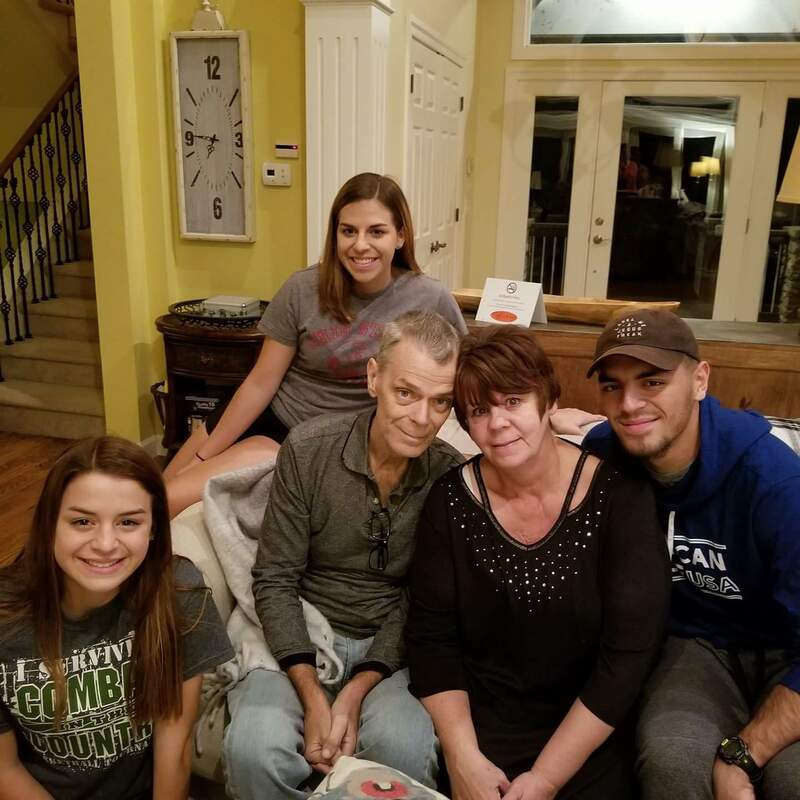 In June Akron native Gina Fox was taken by limo with her husband and two adult children to a Cleveland Indians baseball game. Gina is quite the Indians baseball fan! 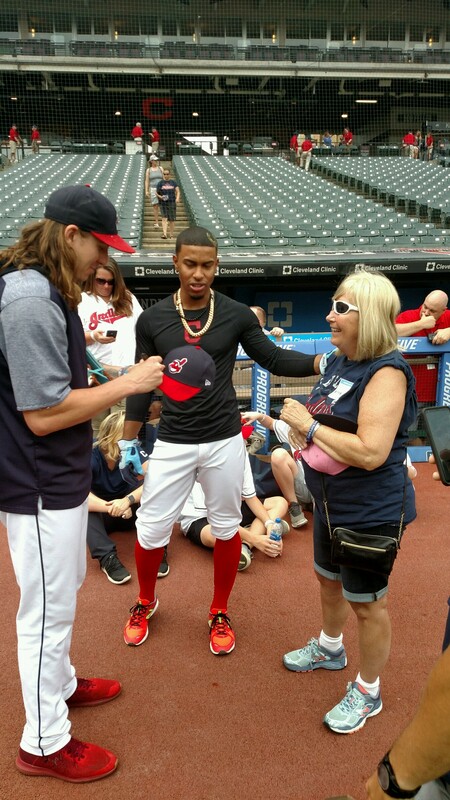 She was surprised that day by Cleveland Indians pitcher Mike Clevinger, as a bonus Francisco Lindor came to greet her as well! Mike is Gina;s all time favorite ball player, needless to say this made her day. Gina and her family stayed at the Westin downtown where they enjoyed room service and spending time together as a family. 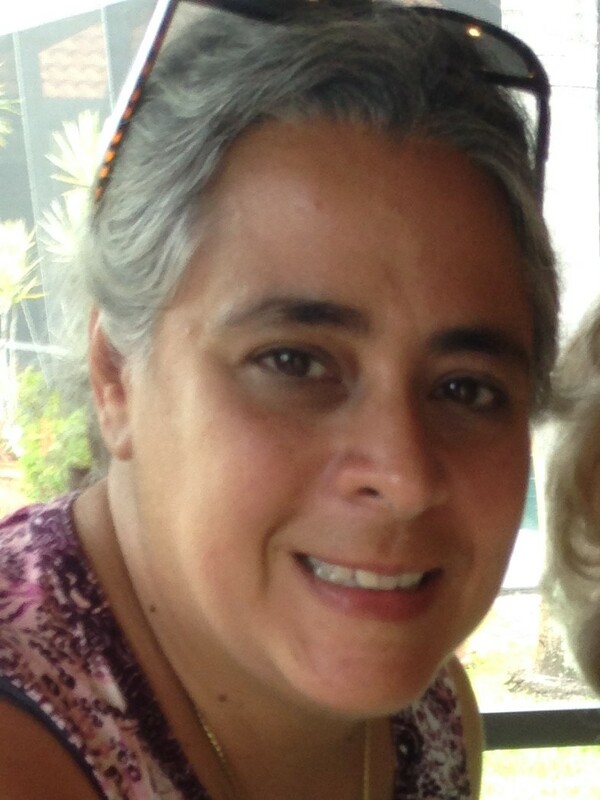 Maria was diagnosed with Stage IV Colon Cancer in September 2017. This came as a complete shock to her and her entire family. Maria went through countless treatments and a surgery. On Christmas day 2017 she was able to go home after her surgery to spend time with her family. At the time her husband Phil was looking for a new job and the two of them began discussing how they should take their four children on a much needed vacation in the summer of 2018. After this discussion they realized finances would be strapped with hospital bills. They heard about Life Is Good No Matter What through a friend and decided to apply for an escape. Life Is Good No Matter What was honored to be able to send Maria, her husband Phil and their four children to Disney in July 2018. This amazing family knows how to live life and enjoy their time together. They did everything from Harry Potter World to the Beach as well as the fun and unique food Disney has to offer! Brittany Parker is a courageous 32-year-old woman with a 5-year old little boy. 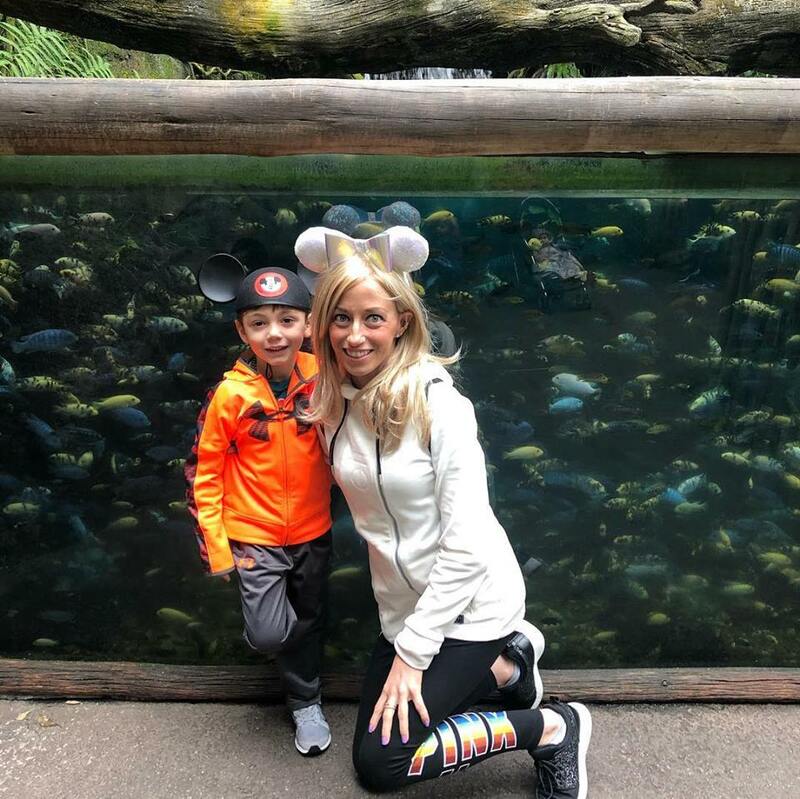 She has always wanted to take her son to Disney so in December of 2018, LIGNMW sent them to Disney. They had a magical time riding rides, seeing the Disney characteristics and eating delicious food. In February, Life Is Good No Matter What sent Gary Hunt to Las Vegas with his fiance, friends and daughter. 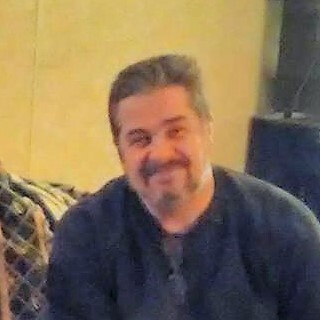 Gary also had a brother in Las Vegas and this added so much to his escape to be able to visit with him. It meant the world to Gary to have his daughter who was about to graduate from high school with him on his escape. The group enjoyed eating at fantastic restaurants while taking on the sights of the strip. Ashley had always dreamed of taking her daughter Payton to Disney, LIGNMW sent the two of them along with Ashley’s parents for a magical escape. Ashley and her family were able to enjoy time away and make magical memories. David West, his wife TaJuana and the couple’s children were able to enjoy a couple of days away at a beautiful lake house right on the water. Being able to enjoy his family, the great outdoors and eating delicious food was something the West’s enjoyed. Cynthia Robinson from McDonald, Ohio was given an escape to Walt Disney World with her mother Leah, husband Ryan and son Colin in October. Cynthia who was a teacher prior to her diagnosis in 2016, a job she was very passionate about was unable to continue teaching due to her aggressive treatments and surgeries. Cynthia and her family, sisters and their children had always dreamed of going to Walt Disney World while the kids were young but due to her treatments as well as the financial burden it was causing her family she did not think they could make this dream a reality. Life Is Good No Matter What was able to send Cynthia and her family on the trip they had been dreaming of! Most importantly her and her whole family would be able to enjoy this trip together without having to worry about how they would pay for it. Cynthia describes herself as a “sunshine spreader”, she was really able to spread that sunshine with her little boy and nieces and nephew on the trip of a lifetime. When they got married almost 15 years ago, Shawn promised Nancy he would take her to Hawaii. He kept many promises, but life commitments kept interfering with that one. Shawn’s dearest wish is to show Nancy how much he cherishes her, how much he appreciates her working full time and caring for him, how much he dearly loves her by keeping that one important promise. We at Life Is Good No Matter What are proud to help him out. It was incredible, amazing, unbelievable. Words just cannot describe how wonderful our Escape was. And the Ritz-Carlton’s French toast was best I have ever had! Mike Emery was 10 steps ahead in preparing us for every venture. He is a genuinely kind man with a big heart. By the end of our Escape, he felt like family. Thank you Mike! Thank you Life is Good No Matter What for this amazing opportunity. We are humbled and our hearts are full. We thank JACK Entertainment, Morton’s The Steakhouse, and the Rock and Roll Hall of Fame Museum for their donations toward this Escape!